Dear those who believe in creationism, PLEASE explain teething to me. There are many who doubt the science behind evolution and instead believe in creationism and/or intelligent design. Creationism argues that everything has been created by the Almighty’s design while intelligent design incorporates evolution and argues that any evolving is taking place with the guiding hand of the Almighty. Essentially, they are arguing that man in its current form is by design and not by accident or survival of the fittest. Teething is when a baby’s teeth break through the gums and come in. Baby Zachary has had a heck of a time with teething. It started when he was a few months old and is still ongoing. Zachary only has five teeth at 16 months of age so we know that he has a heck of a lot more teething to go. As you can imagine, the act of having teeth break through your gums is extremely painful and it results in Zachary not just being uncomfortable, but being in pain. The pain comes and goes as the teeth come in and there are times when Zachary will constantly wake up during the night screaming in pain from teething. There are times when we have been forced to give him baby Advil to relieve this pain. 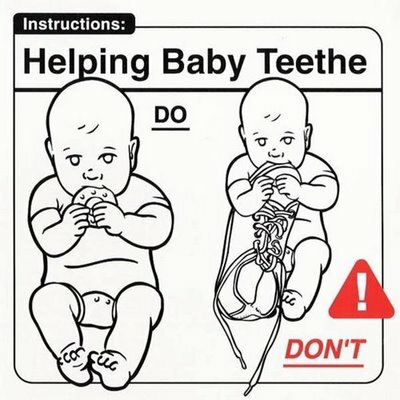 Teething does not sound fun and I would imagine babies are the least capable of dealing with this discomfort/pain. For those that believe in creationism and/or intelligent design, PLEASE explain to me God’s purpose behind teething. It seems fairly inefficient that a baby is born without teeth and has to suffer through immense pain to get those teeth. If you believe that teething is all part of God’s plan then are you arguing that God likes inflicting pain on babies? If the Almighty intended cute, innocent, little babies to suffer then it sounds to me like the Almighty is quite a big jerk. ← Is it offensive that I call my son a midget??? I guess God didn’t give you a sense of humor. It’s hard to decipher what is humor and what is rage, as many atheist blame God for everything that goes wrong. yeah newdaddyhood, you should make zacharys teeth come in less painful. Definitely your fault. There’s many cultures where painful teething is not even an issue. So, yes, you are doing something wrong. More than likely dietary-wise. Sure, our sinning must be causing his teething pain. Makes perfect sense peron who takes things too seriously.